Kitobo “Solar Trees” © New Sun Road INC.
New Sun Road is a California technology company directed by ERGie Jalel Sager (MS’11 , PhD’15). They are committed to implementing solutions to climate change and global energy poverty, provide electricity to communities, health clinics, and education centers in remote and challenging environments. New Sun Road designs, builds and installs SolPower™ micro-grid systems with broadband Internet, remote monitoring and control, and data analytics. 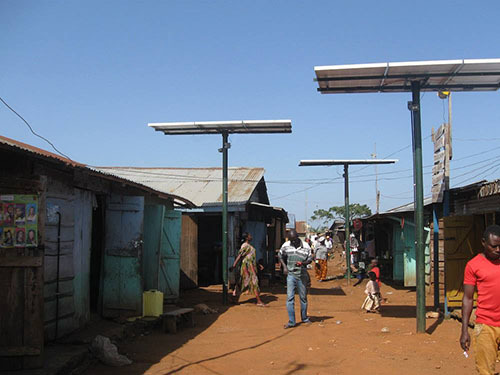 With Affordable Access Initiative support, NSR is building out its next-generation network, micro-grid, and Stellar software solutions for small businesses and communities in Uganda’s Lake Victoria region. Read more about ERGie Jalel Sager (MS’11, PhD’15) here. Visit New Solar Road website here. View Microsoft grant recipients here. Next post: THIMBY House Project Is Well Underway!